Alongside the Strat and Les Paul, the Telecaster completes electric guitar's unarguable holy trinity. 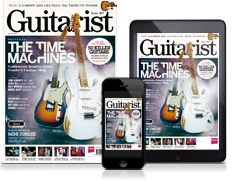 For nearly 70 years, since its birth as the Broadcaster in 1950, this iconic guitar has endured as a touring workhorse, staked its claim in rock history and never left the hands of scores of session pros. The Tele wears its heart on its sleeve. It has survived in the hands of music's hardest-touring acts (Springsteen, The 'Stones et al) thanks to its simple, rock-solid build, while those trebly tones consistently cut-through in studio applications. It is also the perenial blank slate - a no-nonsense plank that can play host to all manner of customisations and tweaks. The Player Tele instantly wins points for its satin maple-finished neck, which handles like a dream. In addition, it packs some of the best Telecaster pickups we’ve heard at this price point - neither brash nor overloaded in the low-end, they're perfectly balanced, ideal for Keef-style open G chordal riffage and big, open chords with a touch of drive. Of course, the trade-off of using hotter Alnico V magnets means the sounds won’t satisfy the ears of fickle vintage enthusiasts, but that’s not who this guitar is for: anyone after an easy-to-play Tele that delivers a clutch of classic tones and handles gain like a champ won’t be disappointed. Rather than year-specific clones, the American Originals aim for a ‘Best of Decade’ vibe. This comes across as an almost Custom Shop-like take on a classic. As such, there's a chunky, retro-vibe here, but the modern 241mm (9.5-inch) fingerboard radius here is a significant ‘fix’. A vintage-style Telecaster never ceases to amaze - especially from today’s perspective. It’s brutally simplistic and still seems like a working tool rather than an instrument to covet. These are two big lumps of wood and, with the Tele’s single coils, there’s more than a little lap-steel to the sound. The feel of the bigger neck, the feel of the ’board and those slightly higher frets add up to a player that recalls vintage, but it’s a bit easier, slinkier, with appealing body. If you hanker after a new USA-made production Fender and want the most vintage-spec possible, this is now it. Vintage-inspired, yes, but with the fixes that many players will embrace. They come fitted with the best Telecaster pickups Fender make these days, too. The Classic Vibe has a four-piece pine body, a timber you might associate more with IKEA than Fender, but actually Leo Fender's 1949 prototype of the guitar that would eventually be christened the Telecaster was built around a pine body. However, while this instrument might be cleverly disguised to look like an early 50s Blackguard Telecaster, its playability is bang up to date. There's a slimmer neck, comfortable action, plus a choice of vintage-voiced Alnico III pickups of the Vintage Blonde Classic Vibe, or the new Butterscotch Blonde's ballsier Alnico Vs. The combination of the lively pine body and hotter pickups means this guitar cuts through a mix just as a great Telecaster should. It also has that legendary Tele tonal versatility in its DNA, which covers anything from jazz to classic rock. Timeless looks and modern playability and tone, and if you shop around enough you'll find one for less than £400. Bargain. Back in 1973, the Deluxe, which also sported four controls and a shoulder-placed three-way toggle switch, was clearly intended to do battle with Gibson’s Les Paul. In truth, like many hybrid designs, it became very much its own thing. 44 years on, the Deluxe is just as relevant. As you might expect, there's a raft of upgrades, not least a pair of Tim Shaw-designed Shawbucker covered humbuckers that outwardly ape Seth Lover’s original ‘Wide Range’ humbucker design. So, while, yes, it can be quite a retro rocker, those controls can access an awful lot more. It’s most definitely a Fender but has sounds you can’t access from your standard Strat or Tele. Add in the smart build, comparatively light weight, resonance and easy adjustment and we have a classic-looking Tele that’s a real mature player’s tool. 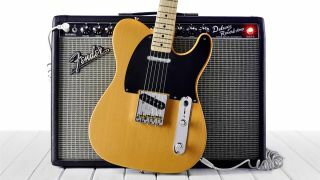 The Nashville Telecaster pays tribute to Leo Fender's first-born's dominance of the studio session scene in Music City, Tennessee, with a guitar that promises both classic Tele and Strat sounds. The bridge and neck pickups are Tele items, while the middle single coil is a Strat model. All belong to Fender's Vintage Noiseless range and come wired to a master volume, master tone and a five-way pickup selector blade switch. This enables a convincing range of tones from Tele twang to Hendrix-like crunchy rhythm tones, courtesy of the Strat pickup. Fender has pimped the Nashville Tele's playability with a 305mm (12-inch) fingerboard - the same as a Les Paul. The result is a low action that doesn't grumble when you dig in anywhere. Regardless of its geographically specific name, don't be tempted to typecast the Nashville Tele as exclusively for the country set. The Elite Telecaster has a classic-looking 'bursted finish, white top-edge binding, a finely centre-joined slab of ash and a rib-cage contour round the back, which really works with that mint-green scratchplate. The six-saddle bridge, with chrome-plated brass saddles, is fully adjustable and we have locking tuners - not really necessary without a vibrato, but they do make string changes fast. It is a simple drive. With the S-1 switch out, it's standard bridge or neck pickup and both on in parallel. Depressing the S-1 switch with the selector in the middle position simply links the pickups in series for more output and a thicker tonality. The noiseless pickups do the job. At higher gains and volumes, however, you will hear some hum pickup, but in every scenario, it is way less than our standard single-coil guitars, making these some of the best Telecaster pickups for pro players. It's the contemporary player that the Elites aim for and, not least at the price, it crams in a lot of upgrades; and then there's the duality of the S-1 switching. A charming guitar. Squier has now seen fit to introduce Fender's revered '72 Thinline to its own range, and it looks the business, with white pearloid scratchplate, finely carved f-hole and Fender- embossed humbuckers. While you'll find the gloss-finished modern C neck across much of Squier's Vintage Modified range, you're unlikely to find tones quite like the Thinline's anywhere else, certainly at this price. Cleans from the neck and middle positions are punchy and persuasive, not dissimilar to fat P-90-ish single coils, but flicking over to the bridge humbucker yields a burly, resonant voice that screams for big open chords and an overdriven valve amp. That's why it's one of the best electric guitars for Indie and alt-rock players. Foo Fighter's man Chris Shiflett's Tele looks stunning. It has a thick plank of alder for a body, a no-nonsense hardtail string-through-body six-saddle bridge, and a pleasingly thick bolted-on maple neck. It's immensely playable - worryingly addictive, in fact. The maple fingerboard is gone in favour of a 305mm (12-inch) radius rosewood 'board with medium-jumbo frets, which makes this guitar as much fun for playing aggressive rock as rockabilly, chicken pickin' or slow-hand blues. The reason Shiflett built his own guitar in the first place was to have hotter humbuckers, and this is where the custom-wound CS1 and CS2 pickups come in. As promised, they're sizzling hot, and render big rock riffs and lead squeals with suitable power and definition. But crucially, they don't shout down the voice and personality of the Telecaster. Root has equipped his Tele with a spec that will even intrigue Slipknot haters. There's the mahogany body in place of the usual ash or alder; twin EMG pickups where you'd typically find stock singlecoils; and locking tuners, a single volume knob and a flat black finish that stands out against the lacquer-coated competition. The snub-nosed headstock and iconic body outline might be the same as in 1950, but Root has played fast and loose with the rest of Fender's blueprint. Pick this baby up and you'll notice a marked weight increase over stock Teles due to the density of the mahogany. Grip the neck and you'll find yourself fretting like a demon due to the C-profile and 12-inch radius board. Telecaster purists will argue that this model is defined by its snap 'n' pop, and there's none of that here, with EMG's 60 and 81 units specialising in fat, thick filth, the mahogany lending further warmth to chugging rhythm parts.